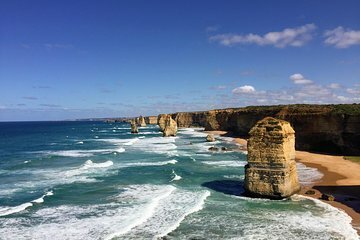 Scopri le principali attrazioni della Great Ocean Road in questa escursione guidata. Intraprendi il tuo viaggio e batti la folla mentre impari a conoscere i paesaggi pittoreschi della regione e le belle città costiere da una guida informativa. Visita siti come Colac, Twelve Apostles, Loch Ard Gorge, Port Campbell, London Bridge e Great Otway National Park Rainforest. Una partenza mattutina significa che questo tour arriva alle attrazioni prima che arrivino le folle e gli altri autobus turistici. My daughters went on a day trip with their uncle visiting from abroad. Everybody came back very relaxed and happy. Best day of the holiday for my 13 year old and my brother. My 8 y old found the trip a bit long :). Beautiful trip. Highly recommend. They enjoyed the fact that it was a smell bus, that allowed them to avoid crowds at stops. I had a great experience choosing this tour, the view is amazing and we stopped and a lot of beautiful places. The tour guide told us some nice story about the places and his super courteous. Me and my partner took a lot of photos together thanks to Orlando! I highly recommend this tour for couples and friends!